The "one-room" genre only applies to the IntroComp release. 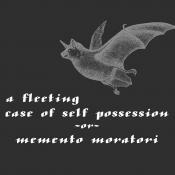 A Fleeting Case of Self-Possession, or, Memento Moratori (Lea Albaugh; 07-Jul-2010; Z-code). IntroComp 2010: 3rd place of 9 entries. Download Lea-Albaugh--Memento-Moratori.ZIP from the IntroComp site. A Fleeting Case of Self-Possession, or, Memento Moratori - at IFDB. A Fleeting Case of Self-Possession, or, Memento Moratori - at ifwizz interactive fiction (in German). This page was last modified on 27 October 2014, at 21:23.